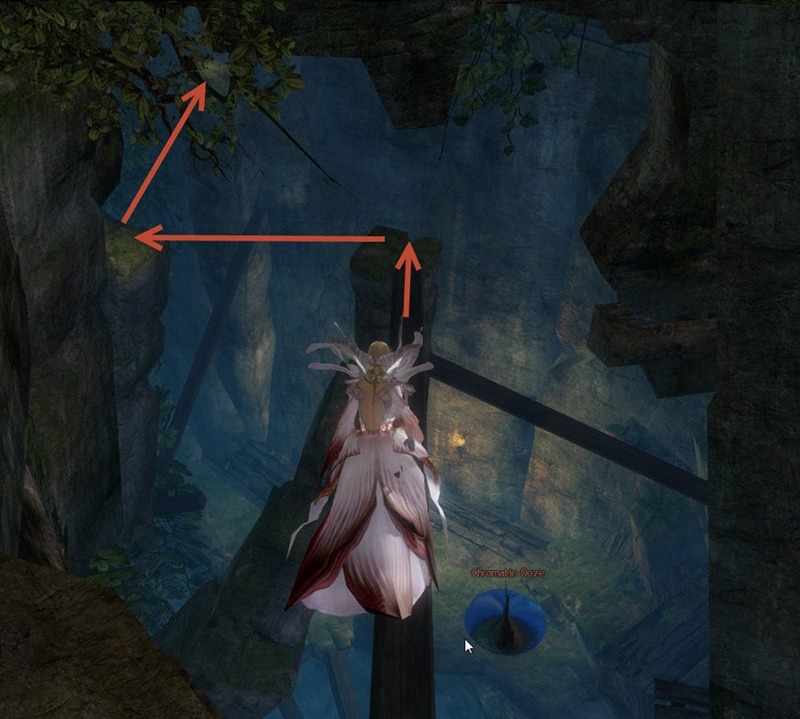 GW2 Only Zuhl jumping puzzle guide with detailed explanations and video walkthrough. 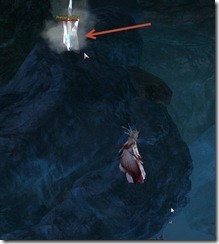 Only Zuhl is a jumping puzzle on the NE corner of Timberline Falls, directly north of Foundation 86 Waypoint. 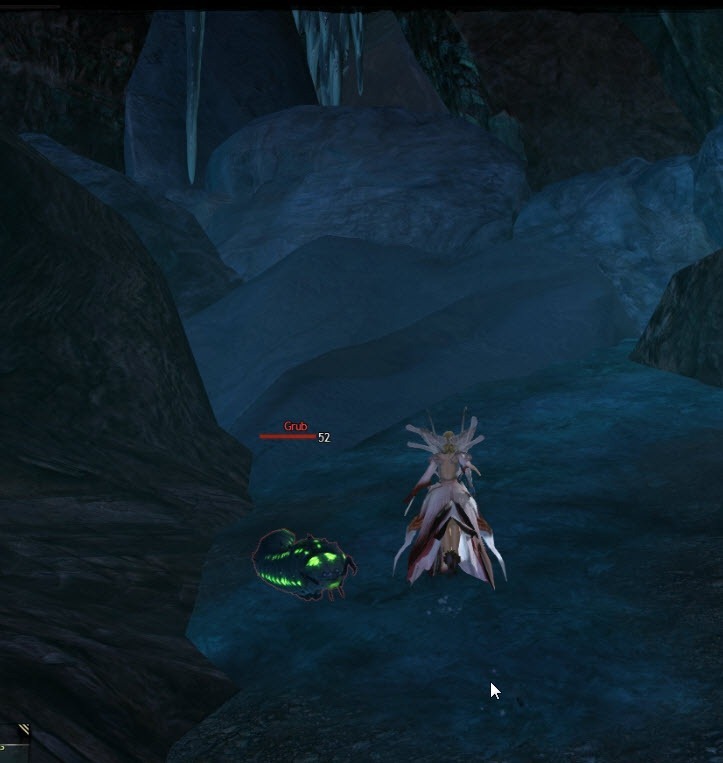 Run through the cave, there will be some bats and grubs you can skip. 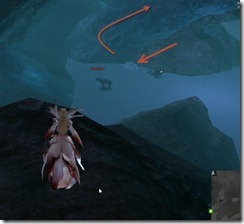 You will need to take a right and enter the ice portion of the cave. 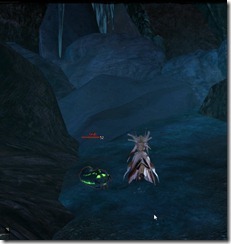 Once you are inside the ice caves, hug the left wall and you can skip most of the Murellows. 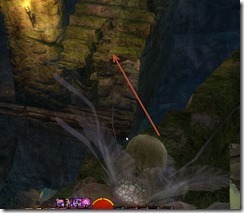 You need to grab the snowball on the ground and head up the ledge above it. You get three charges with the snowball, so don’t waste them. 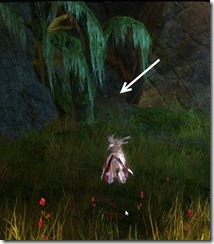 As you head up the ledge, you will need to hit Pressured Ice with the snowball so they don’t knock you off. The next part is pretty tricky. 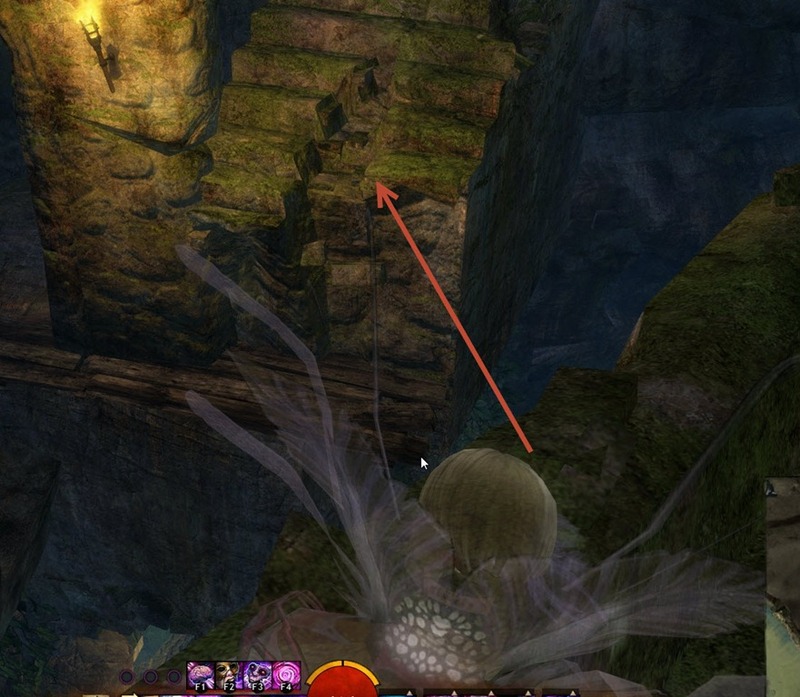 You need to jump down but a lot of the ledges are trapped. 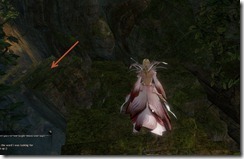 You will need to go around to the other side and jump down to a ledge below the entrance that is safe. From there, jump on the rusty pipe and get down. The next part of the puzzle gets slightly harder as you will need to avoid exploding mob running at you and various traps. 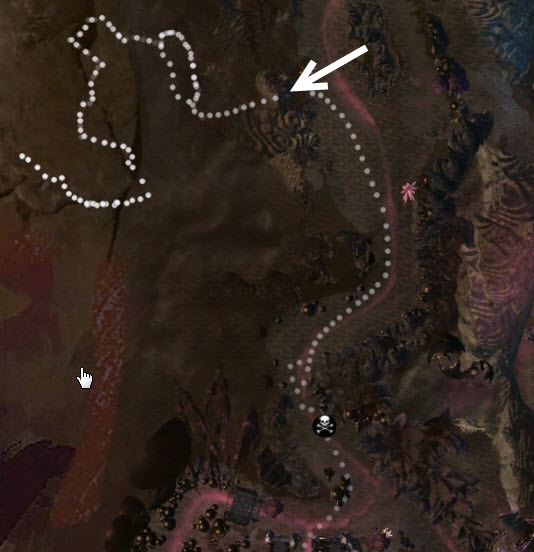 Here is the route to take. Once you are at the top, drop down to a pipe below and keep running forward until the end of the pipe. 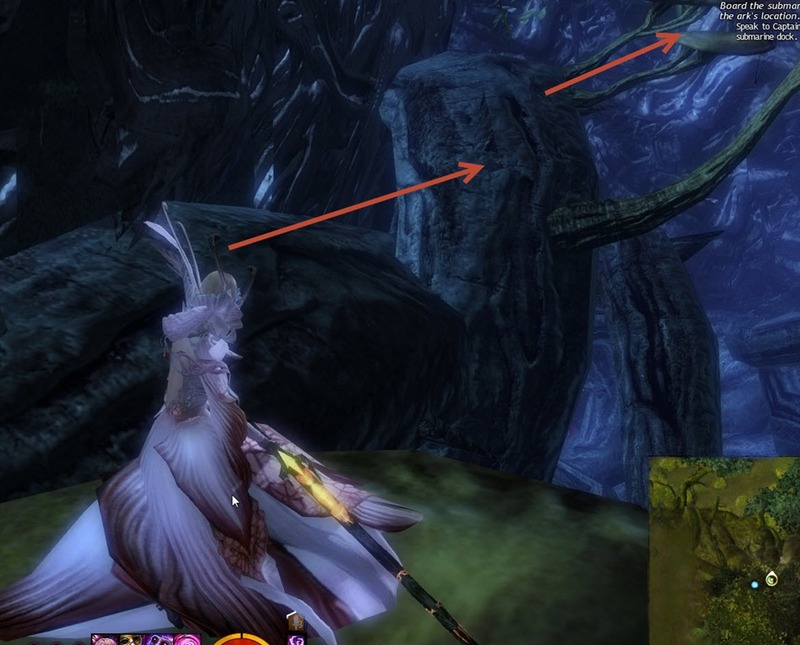 You will need to dodge some traps here. Once you get to the end, immediately take a right and just run into the room. 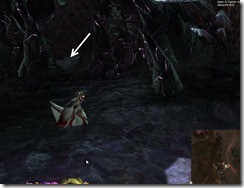 Inside the room is a group boss that you will need to defeat if you want the chest. 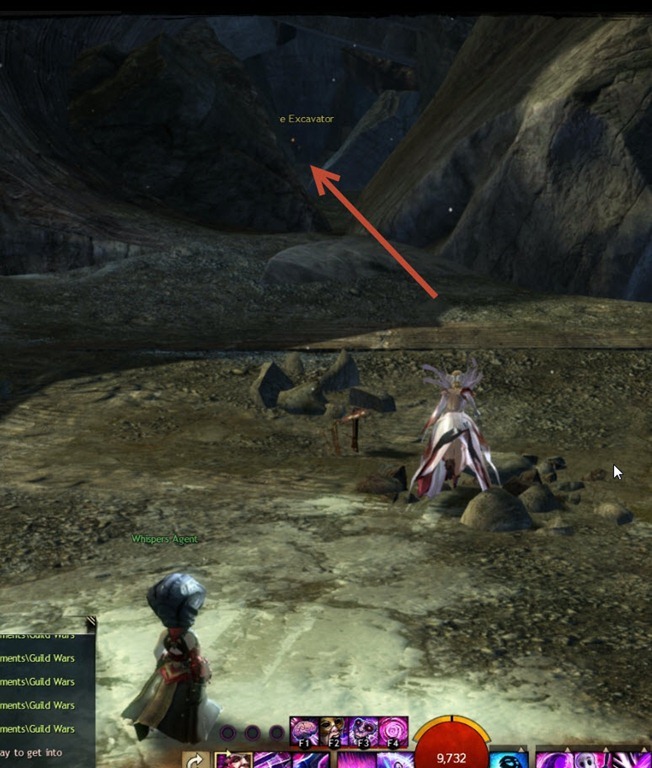 Otherwise, you should get the achievement as soon as you enter the room. 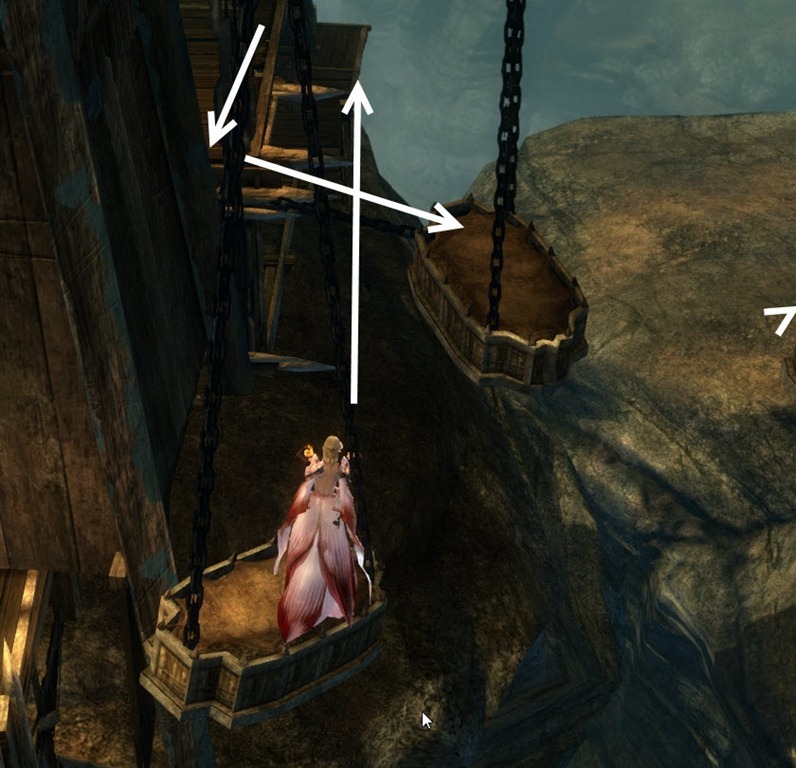 GW2 Conundrum Cubed jumping puzzle guide with detailed explanations and video walkthrough. 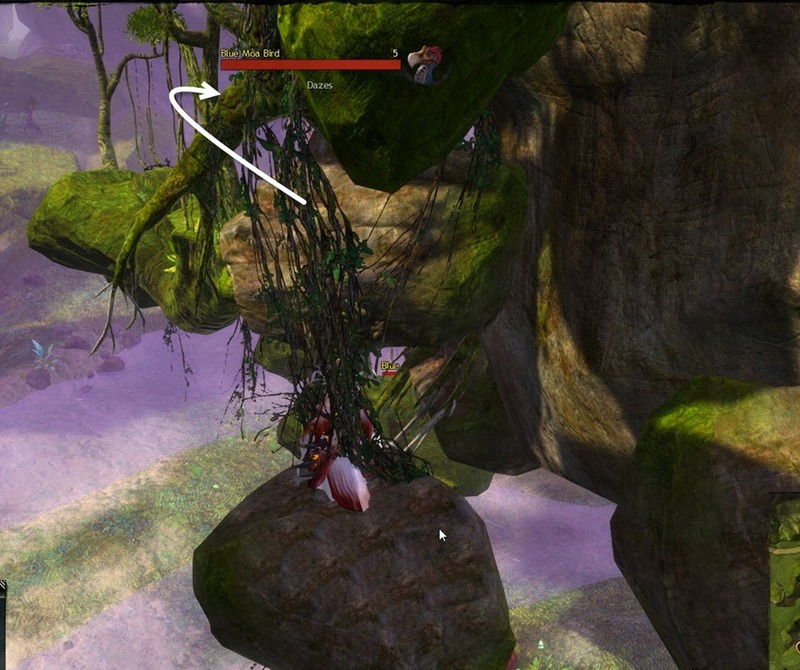 Conundrum Cubed is a jumping puzzle in the NW corner of Mount Maelstrom, directly north of Govoran Waypoint. The puzzle itself is very short and easy but may take a couple tries to get used to the “cubed” atmosphere. 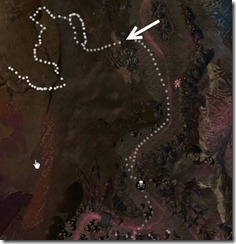 Directly north of Govoran Waypoint is a tight gap that you will need to get through. Jump across these cubes. 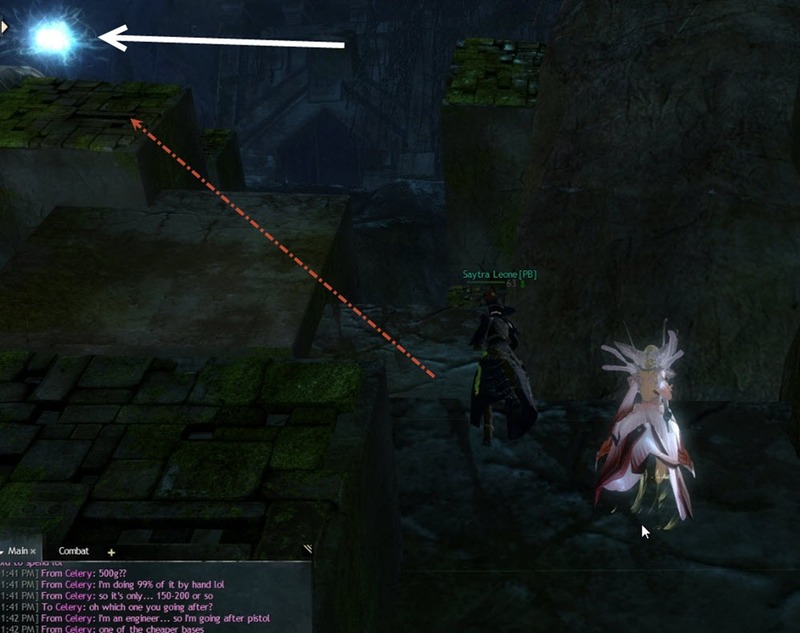 Watch the spike trap pattern carefully and jump once the spikes go down. These spikes won’t kill you but they will knock you off the cube, forcing you to repeat the jump.Once you get to the end of the three cubes, jump to this cube and then onto the branch. 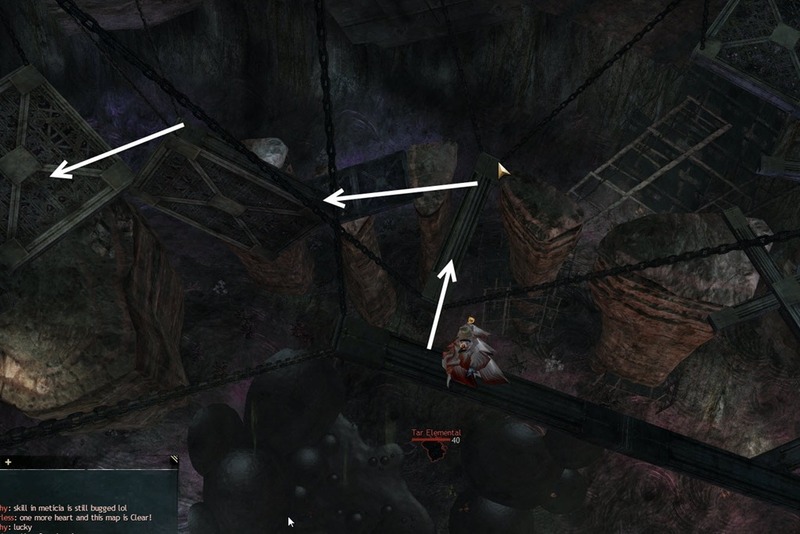 Once you make it past the first portal, you will need to get past two swinging log traps. 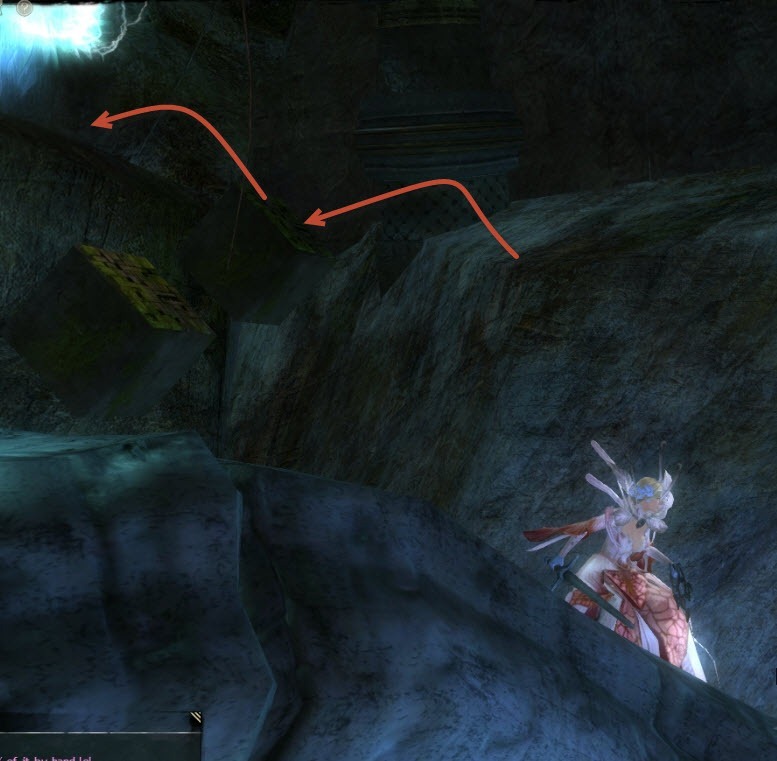 Just run through on the inner wall so you don’t get knocked off if you do get hit. 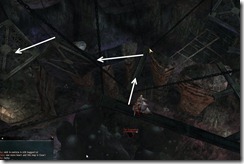 Once you made it past the 2nd portal after the log traps, do not take the portal immediately in front of you. Instead, jump to the cubes on your left. 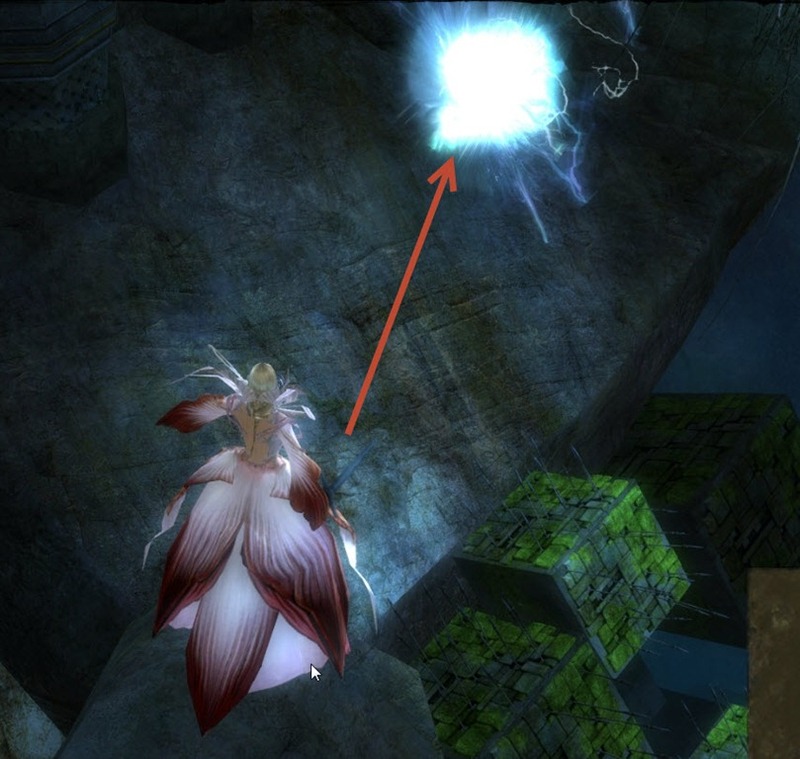 Your goal is the portal at the end of the cube jumps. 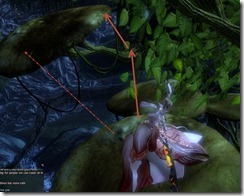 The portal is a bit hard to activate, you need to jump on the otherside of the pillar (becareful that you do not fall off). 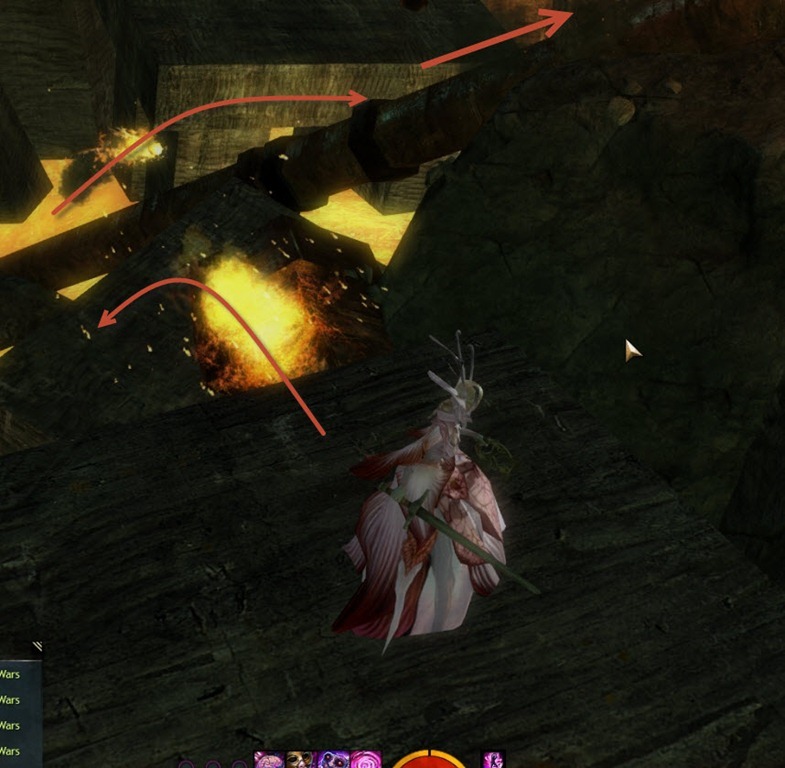 Once you get through the 3rd portal, jump down and go through the 4th portal. 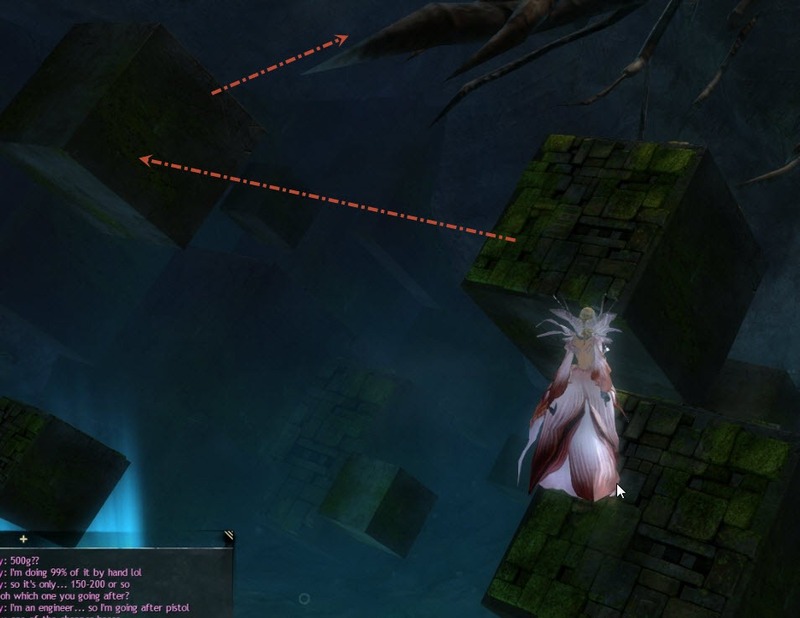 Passing the 4th portal, look at your right and jump on these cubes.The last portal is right after. 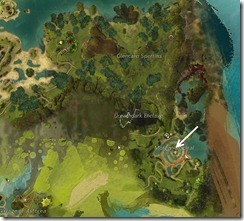 GW2 Cursed Shore Karma vendor list. Cursed Shore is a L80 zone in Orr. 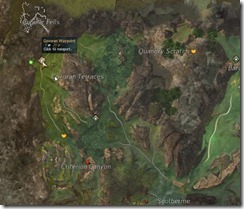 While this zone does not have any tasks/hearts, it does have 8 karma vendors that sell Fine/Mastercraft L80 gear for karma. 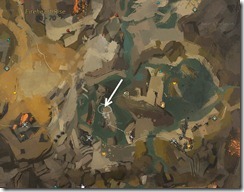 This list does not include the temple karma vendors that sell armors for 42k karma per piece. 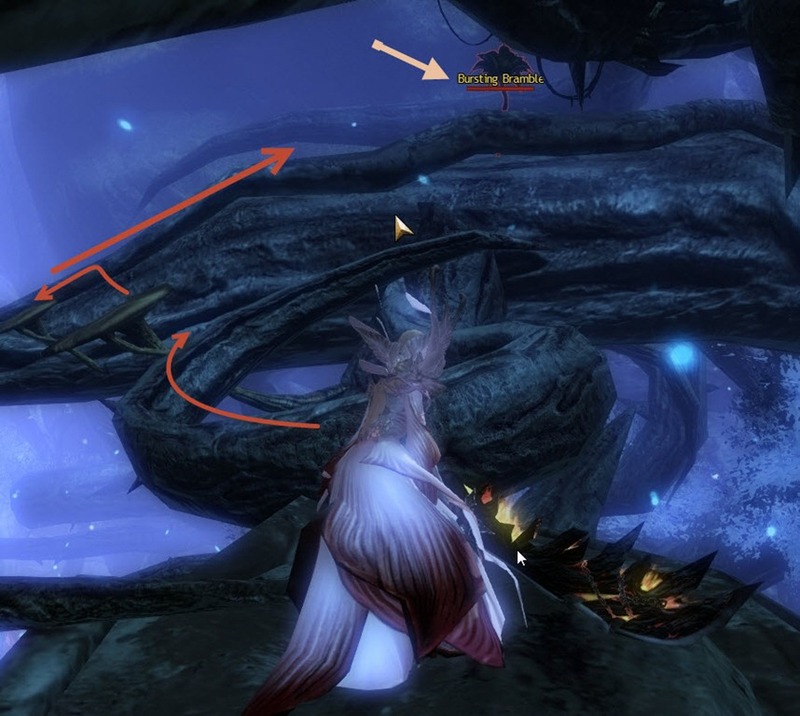 Comprehensive GW2 endgame gearing guide for new and returning L80 players. Updated for Feburary patch. 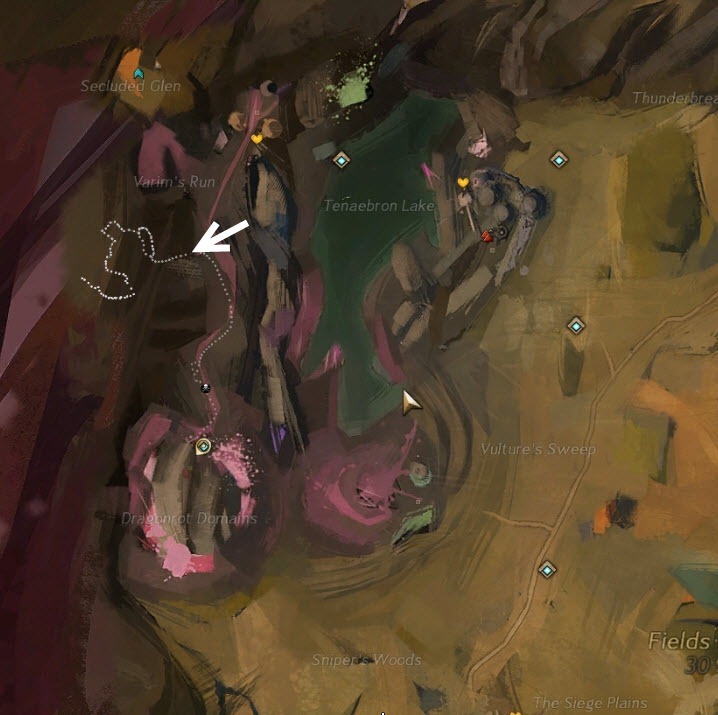 Guild Wars 2 cooking material farms list with map and detailed instructions for every zone.”Farms” in GW2 refers to a collection of eight identical cooking material nodes all clustered together. 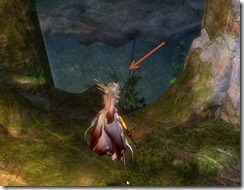 They provide crafting materials that may not find elsewhere. 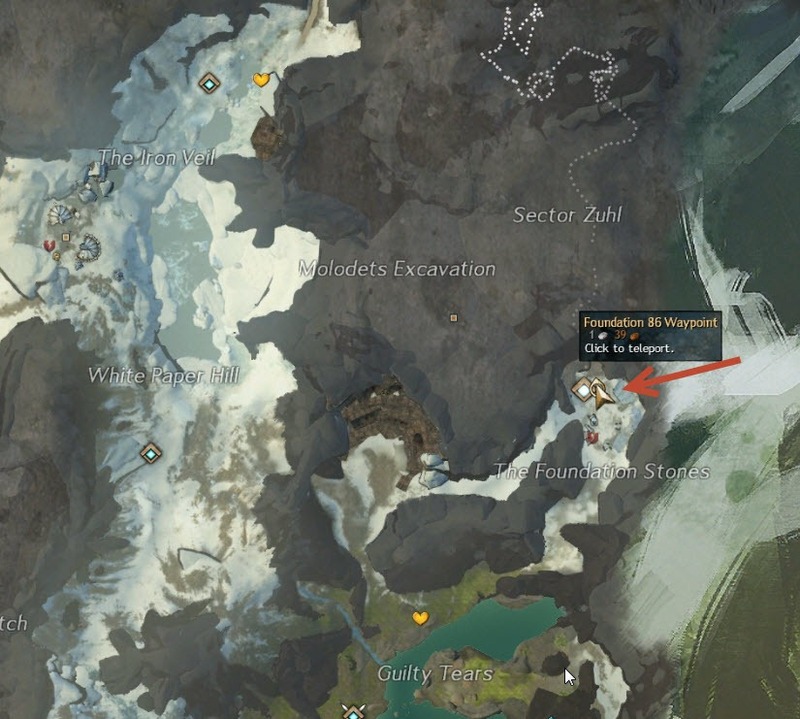 Farm will reset every 23 hrs. 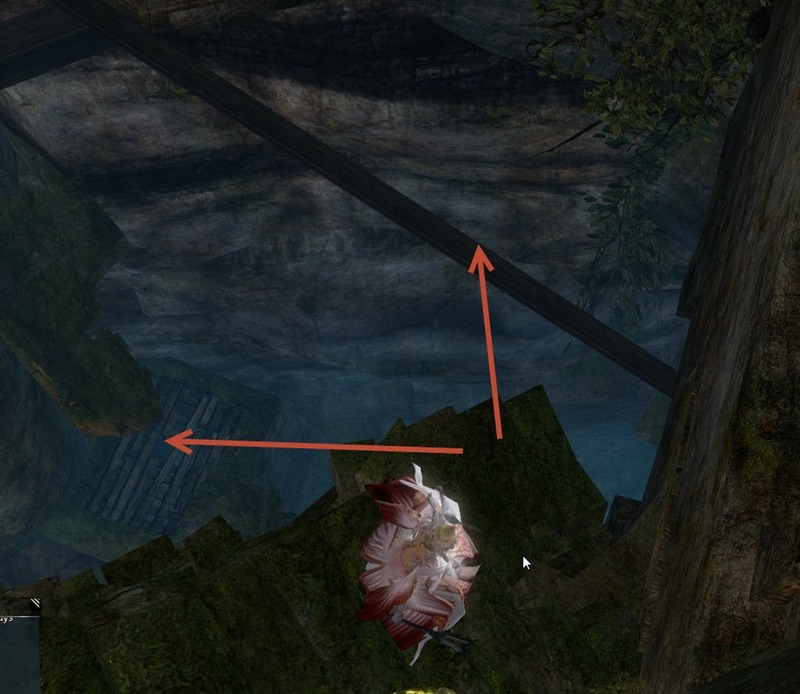 GW2 Collapsed Observatory jumping puzzle guide with detailed explanations and video walkthrough. Collapsed Observatory is a jumping puzzle in the SE portion of Kessex Hills. This puzzle is fairly short and simple but might be confusing for first timers. Hopefully this guide will make it easy. 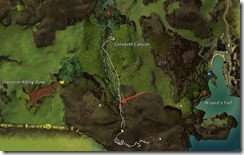 You will want to head to Cereboth Waypoint on the SE corner of the zone. 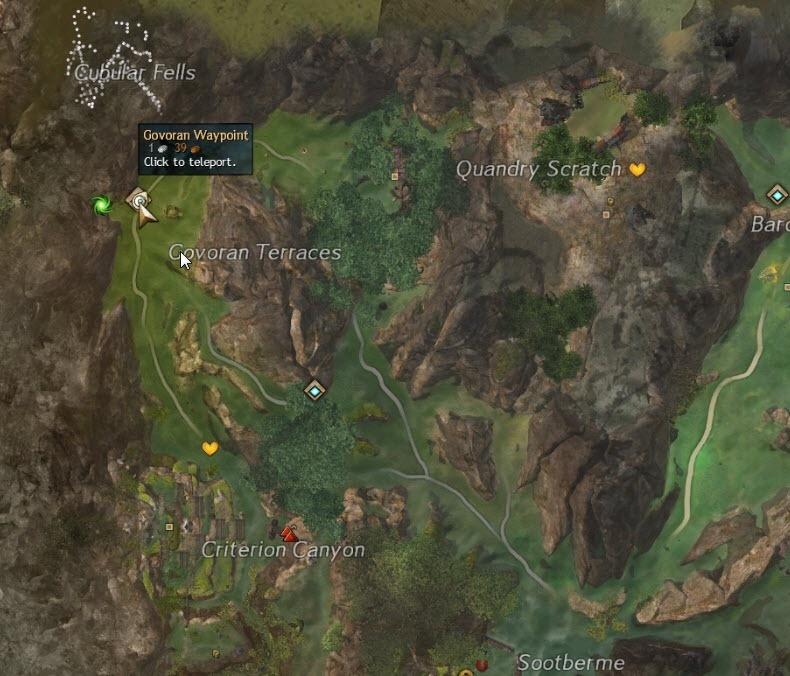 Once you are there, head south, towards the waterfall.Soon enough, you will see a bunch of oozes that you can just run past and skip. Once you get past the oozes, jump on the wooden plank below and go through some broken stairs. 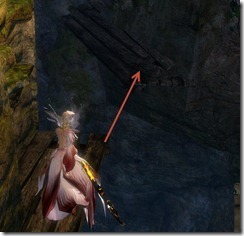 At the end of the stairs, you will see this large beam. 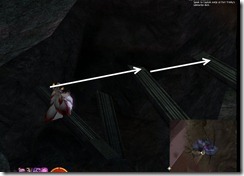 Ideally, you will want to make it onto the beam as it is the fastest path to the chest. 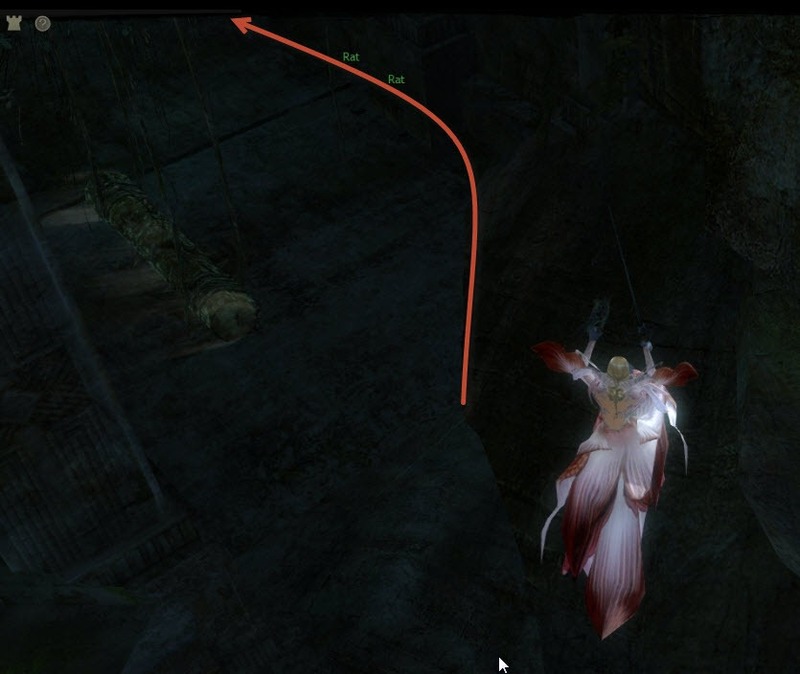 I find the jump fairly difficult personally and I always fall below anyways so I just jump down to the left. 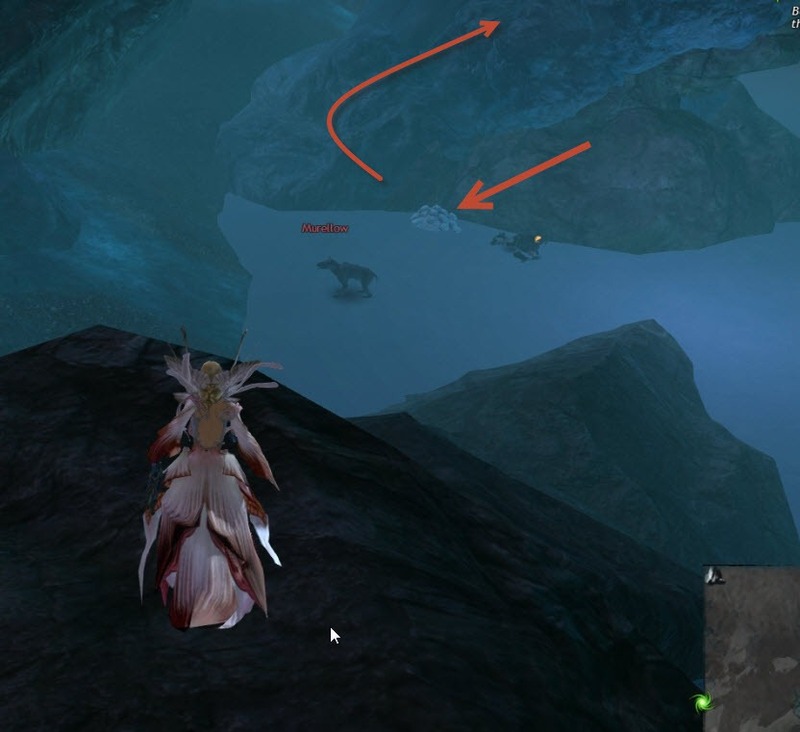 Once you are down there, just run up the stairs on your left and jump on the rocks covered by the waterfall (make take a couple tries). 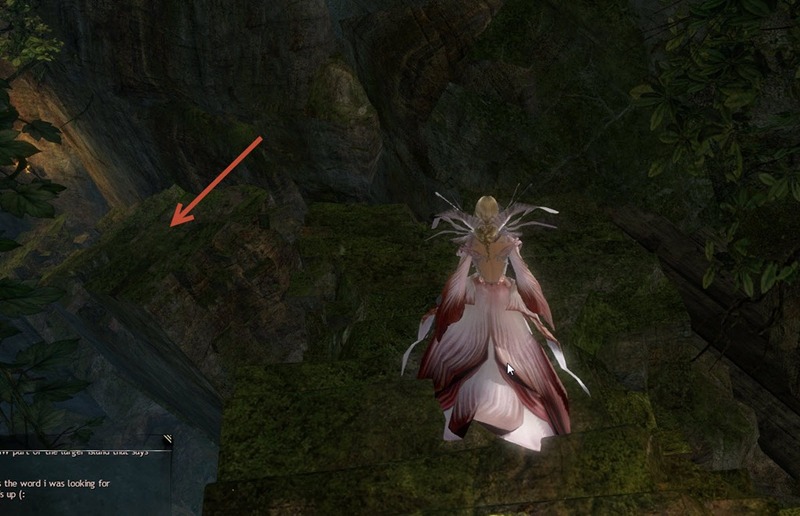 From here, you can just jump on the beam on top of the tower. 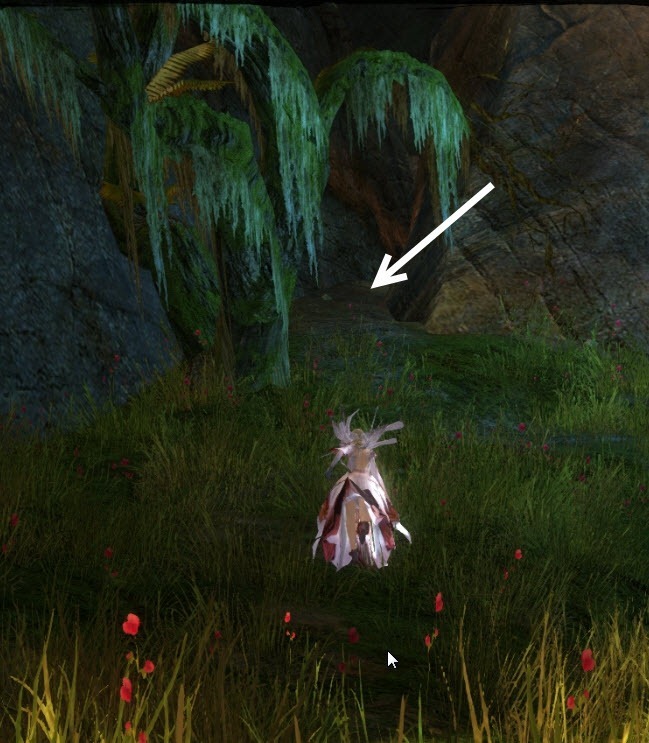 At the end of these jumps, you will see this little building with an ooze inside it. 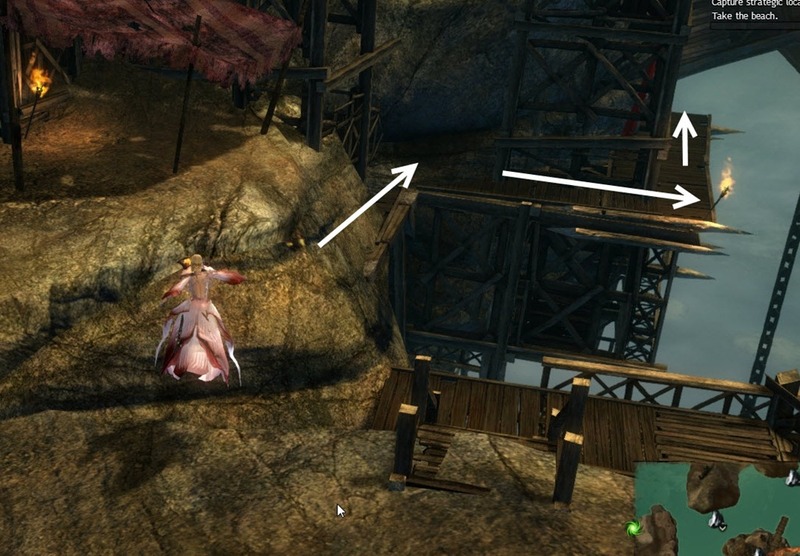 Kill it so that it doesn’t bother you when you need to jump over the building.Around the building is the wooden plank that will take you to another plank across. 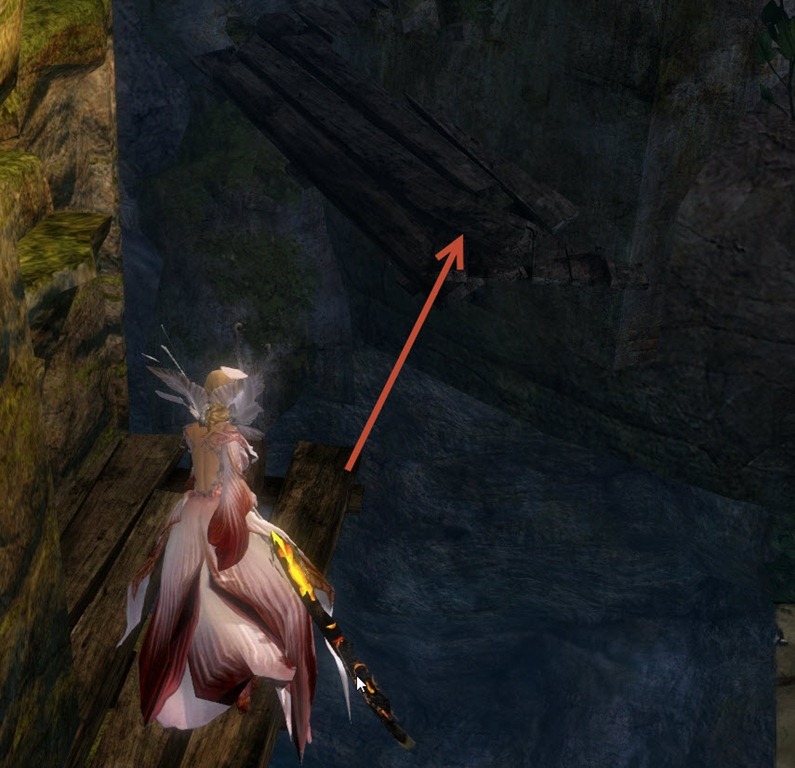 Go up the stairs behind the wooden plank and make this long jump to the staircase here. 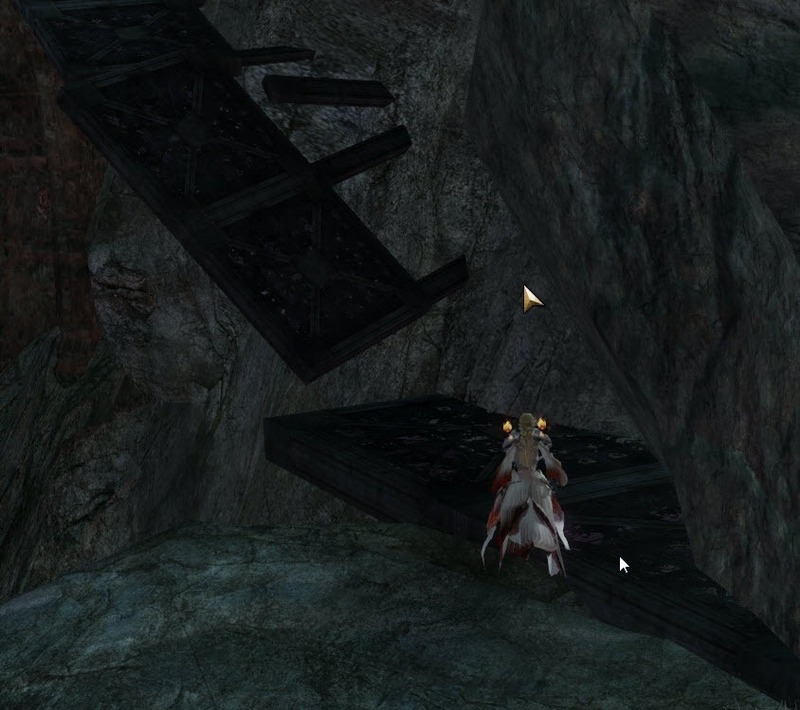 Go up the stairs, jump down this hole to fight a baddie and get your chest & achievement! 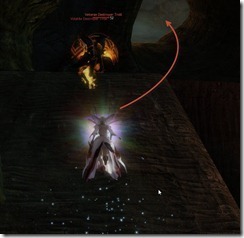 Guild Wars 2 Dark Reverie jumping puzzle guide with detailed explanations and video walkthrough. 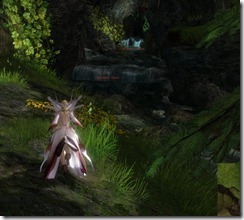 Dark Reverie is a jumping puzzle in Caledon Forest located right behind Morgan’s Leap. 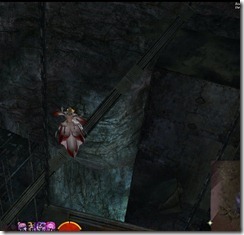 Players wishing to attempt this jumping puzzle will need to successfully attempt Morgan’s Leap first. 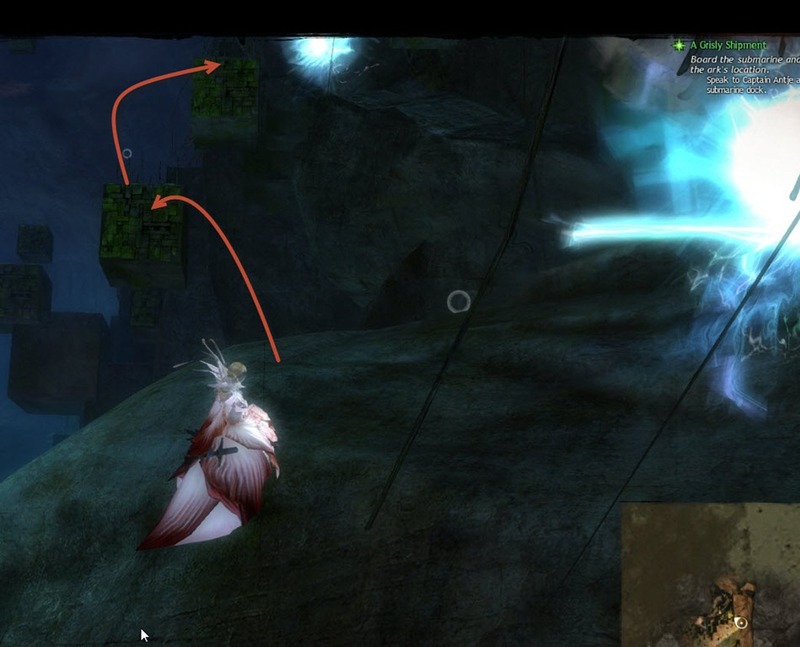 This puzzle has one difficult jump but the rest are fairly straightforward. 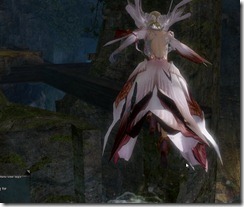 Missing a jump, however, will most likely cause death due to fall damage. 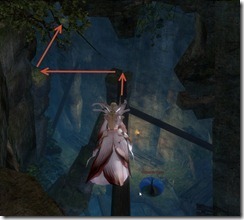 If there are no players below to rez you, you will need to redo Morgan’s Leap to start the puzzle again. 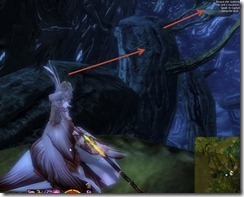 After you successfully finish Morgan’s Leap, you will need to run ahead past the friendly Jungle Spider Hatchlings and jump over a small gap.There will be a couple mobs (Nightmare Court Archers, Spiders) to fight through before you can jump down. 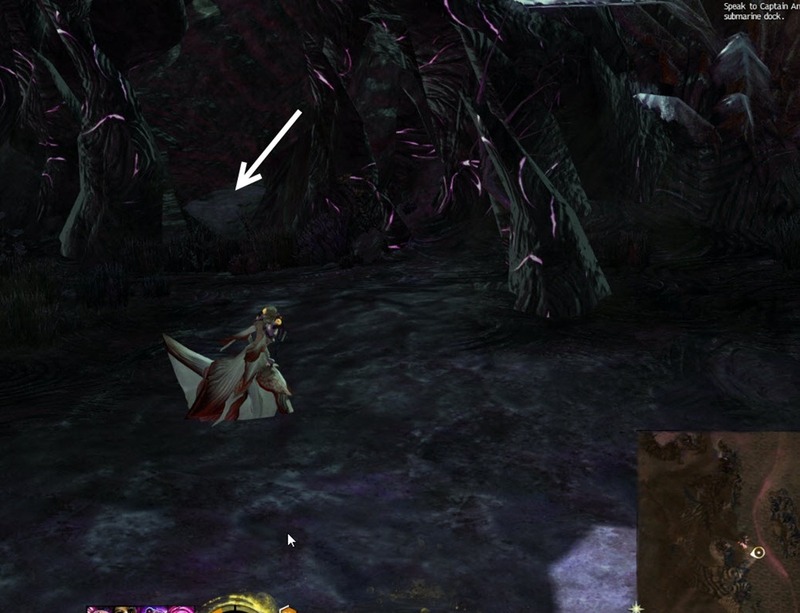 Once you get to the bottom, you will need to be super careful as there are quite a few veteran and small groups of mobs roaming. 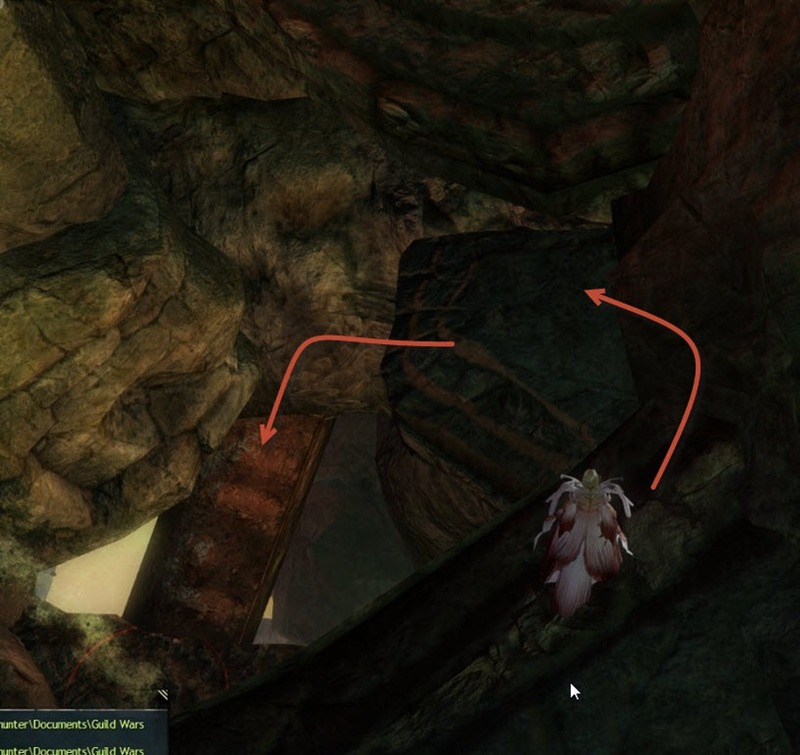 You will need to head straight across to the other side, where you will see a bunch of mushroom steps that go up. 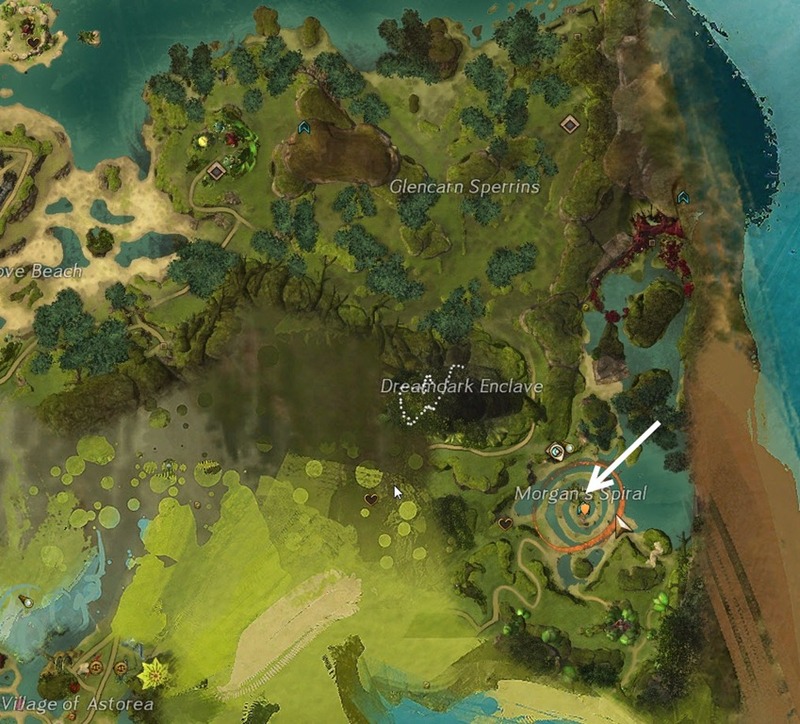 Make sure you kill any Nightmare Mortars and Bursting Bramble you encounter along the way. Bursting Bramble, especially, will put Confusion and other nasty DoTs on you so becareful when killing them that you don’t kill yourself. 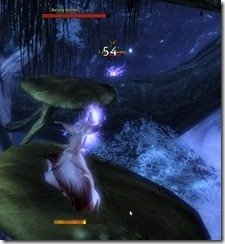 Not killing them will likely put you in combat, which will most likely cause you to miss jumps. Your first semi difficult jump is here, you will need to kill the Bursting Bramble first and jump on top the branch the Bramble was occupying. Arrows illustrate one path you can take here. 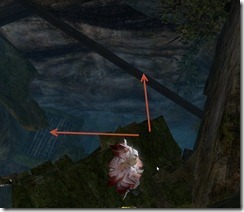 Another not so straightforward jump is here, which is close to the most difficult jump in the entire puzzle. 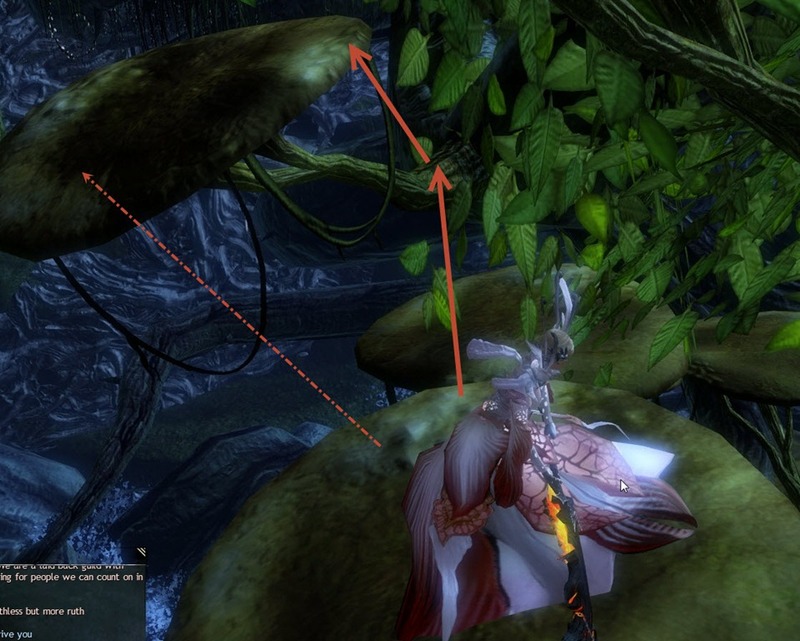 Once you get to this jump, your first instinct is probably to jump directly on top of the leaf (dotted line). 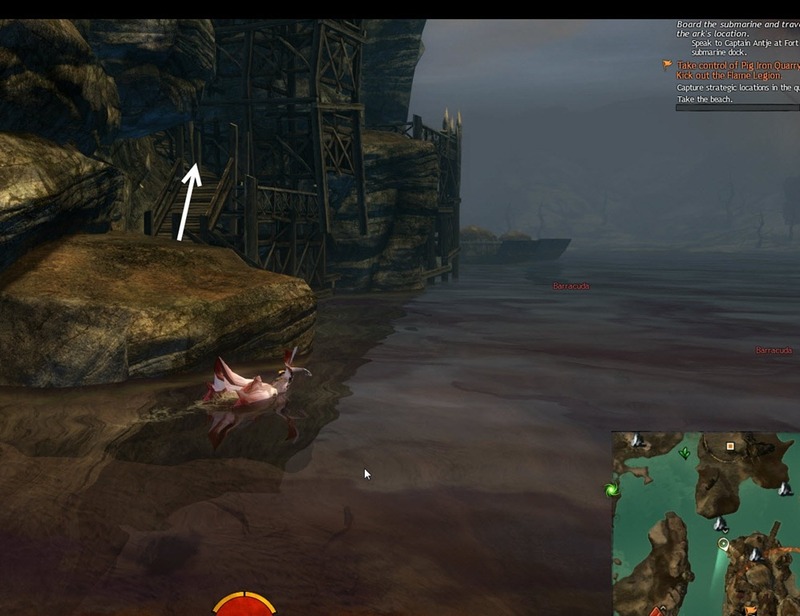 A lot of people don’t make this jump and fall to their death (on populated servers, you can see a pile of dead bodies below, waiting to be rezzed). 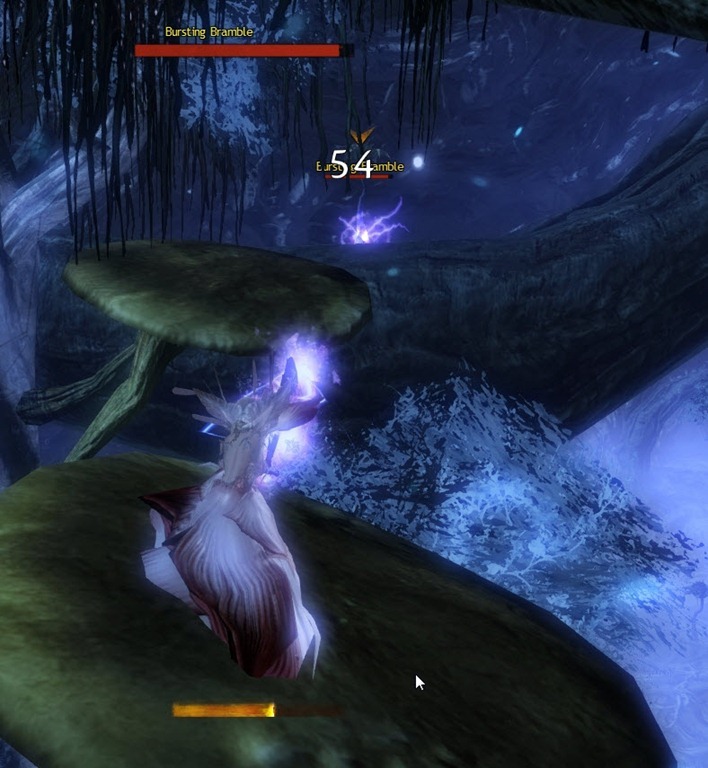 What I found easier is to actually jump on the branch instead and then jump up on the leaf. 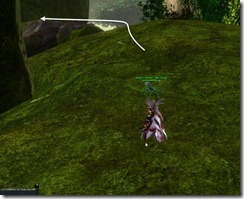 Past this jump, the end is not far off and there are no more difficult jumps. 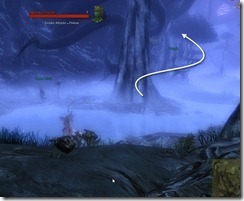 Guild Wars 2 Morgan’s Leap jumping puzzle guide in Caledon Forest with detailed explanations and video walkthrough. 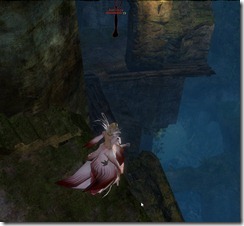 Morgan’s Leap is a jumping puzzle in the SE corner of Caledon Forest. 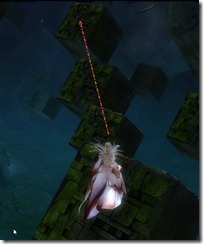 The puzzle itself isn’t too hard but can be a bit frustrating for those new to jumping puzzles. 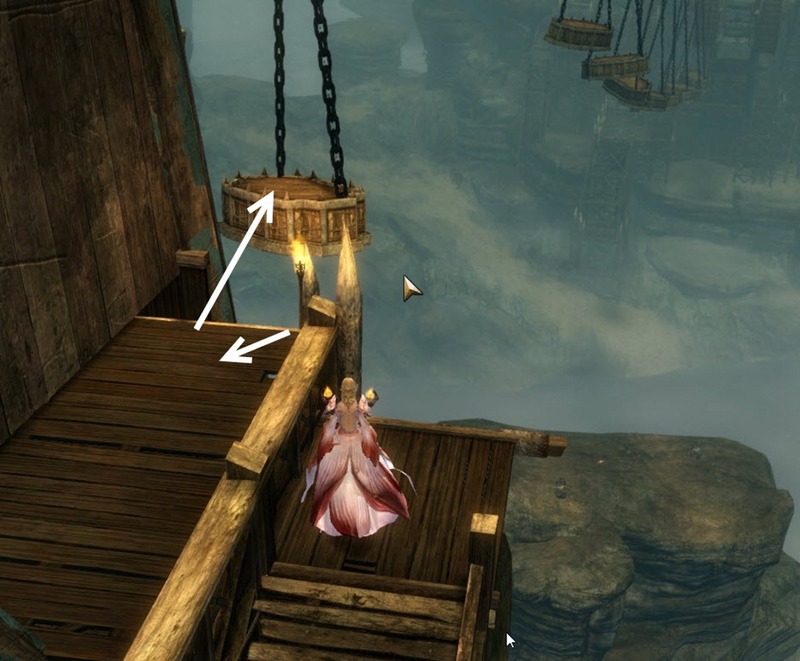 If you are looking to get the Dark Reverie achievement, be sure to not take off after you get the achievement for Morgan’s Leap as the puzzle is right after. 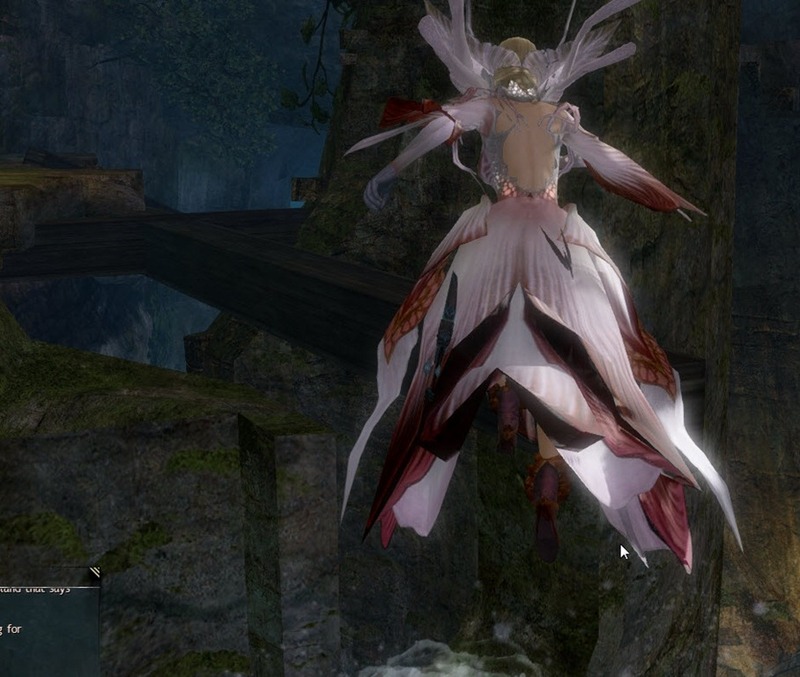 Check out this guide for Dark Reverie jumping puzzle. 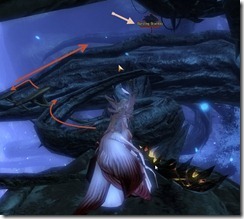 The jumping puzzle starts at the tree in Morgan’s Spiral, which is in the SE corner of the zone. 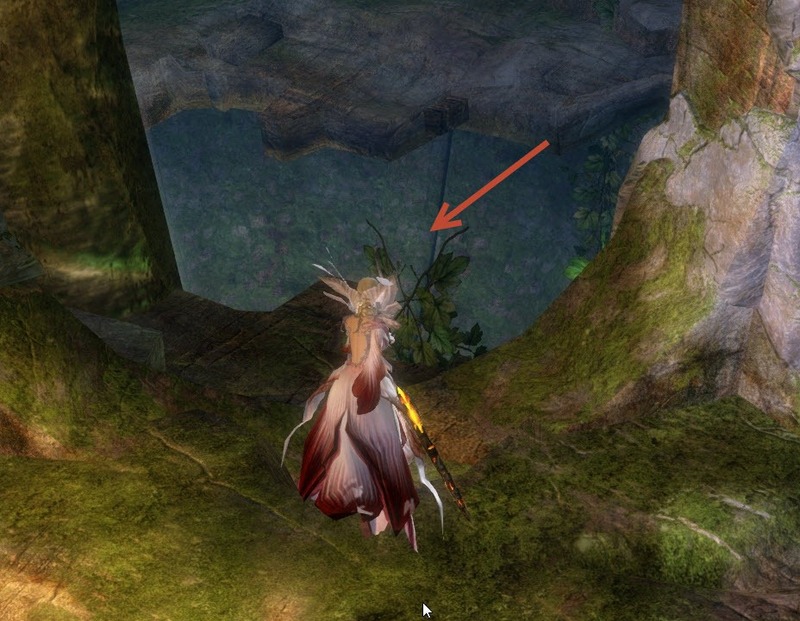 If the tree is not active (leaves not climbable), you will need to wait for for an event to occur to activate it (you can try brute jumping it). 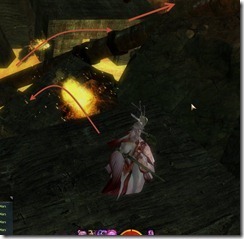 GW2 Pig Iron Quarry jumping puzzle guide with detailed explanations and video walkthrough. Pig Iron Quarry is a jumping puzzle located on the SE portion of Fireheart Rise, just southwest of Pig Iron Waypoint. 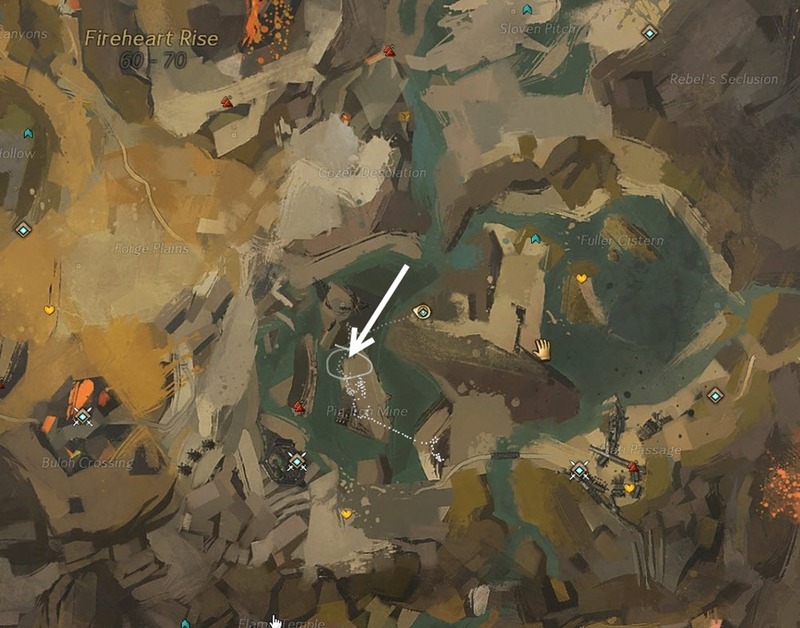 Head to this location on the map and cilmb up the wooden ramp. 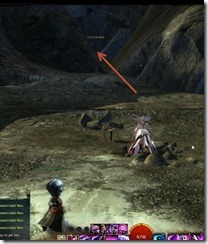 Keep going up until you are at the very top, you will see a friendly Grawl Priest to your left. 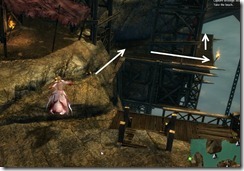 Look to your right and you will see some wooden ramps attached to the cliff. 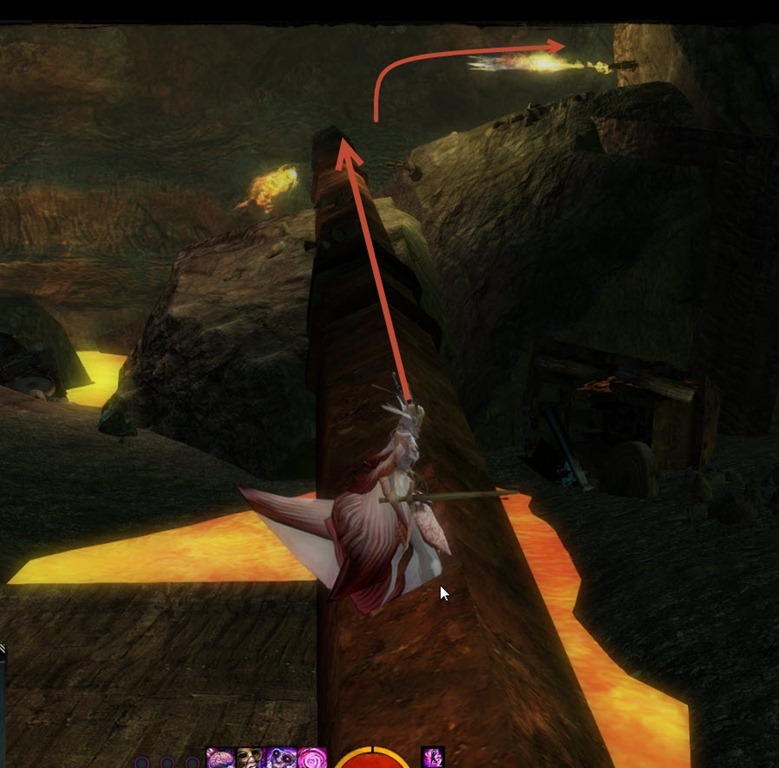 Keep going that way until you see a line with stuff hanging down from it. You may not able to make the jump to the 2nd swinging thingie. If that is the case, use these jumps to get up there. 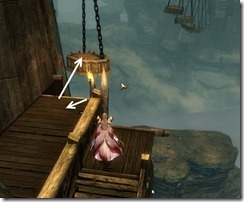 Rest of the puzzle is simply jumping through the swinging thingies. 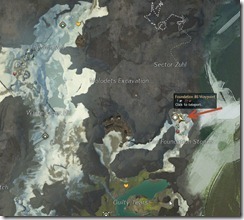 You don’t need any swiftness buffs here but it may help for the last couple jumps. Beware of screenshake and wait it out before making the next jump (or you may miss it). After you get through these swings, you will see a ramp to go up. 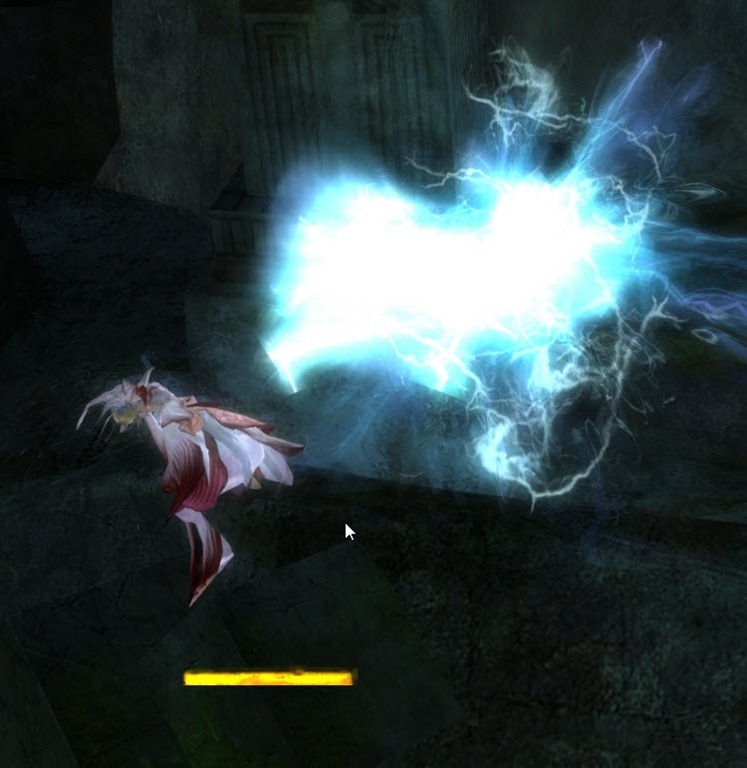 Follow it up and you should see a Flame Legion Shaman guarding a large chest. Just hop on the edge and jump over. 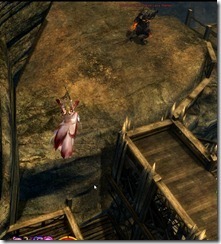 Beware that the Flame Shaman attacks will knock you off the edge if you are not careful! 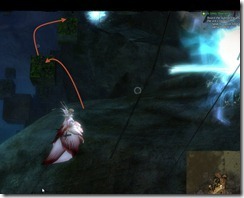 Guild Wars 2 Branded Mine jumping puzzle in Fields of Ruin with detailed explanation and video walkthrough. Branded Mine is a puzzle located on the NW corner of Fields of Ruin (just north of Helliot Mine Waypoint). 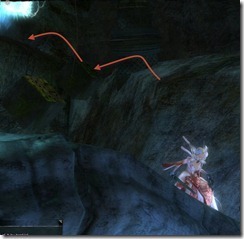 While most of the jumps are not too difficult, the screenshakes and the falling boulders can make you miss jumps. 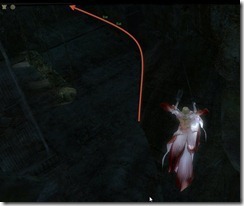 Failing a jump will usually result in death due to long fall distance and forces you to run back. 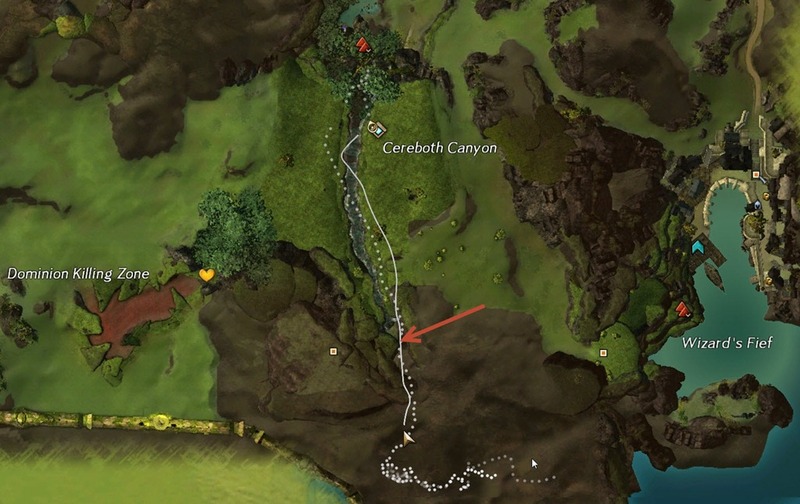 Once you get to the location indicated by the arrow, there should be a small hole that will lead you to the cavern that hosts the puzzle. 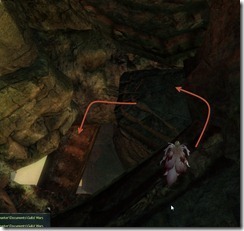 Once you are inside the cavern, take a right and climb up the beams. From here on, you just have to jump between beams. 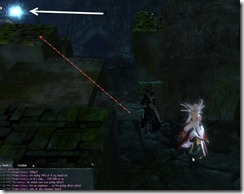 It make take a bit of practice to not over or underjump between beams. The part you may get stuck on is here. 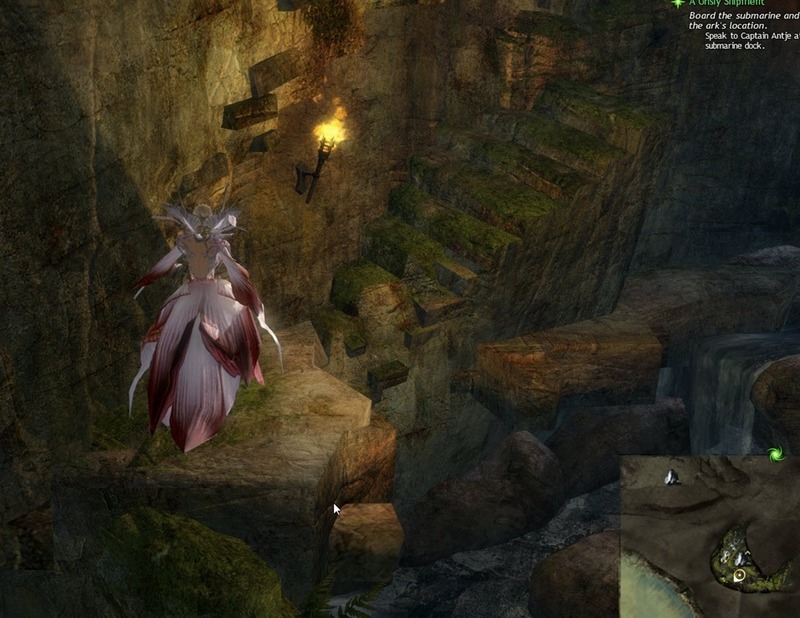 The next jump after is also kinda tricky. You will then need to make a big leap of faith (use swiftness here if you need) and to the platform with ravens. 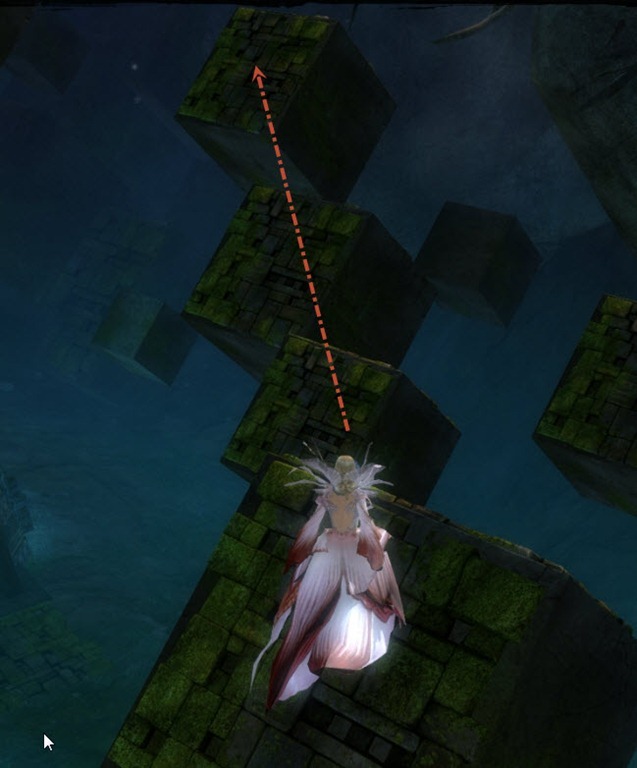 Ahead is just a couple more beams before you finish the puzzle but can be a tricky (I failed here a couple times and had to start over). You will want to jump on the inner side of the beams so that you have the least distance to jump and there is a beam underneath incase you don’t make the jump.